OBSOLETE - Domain is no longer working and Twitter account hasn't been active since 2010. I am fed up sitting all day refreshing the home page waiting for that elusive question on symfony that I can answer and who uses RSS these days? So using tags and massive fonts you can now get a tweet with a link the the question title in your update stream. 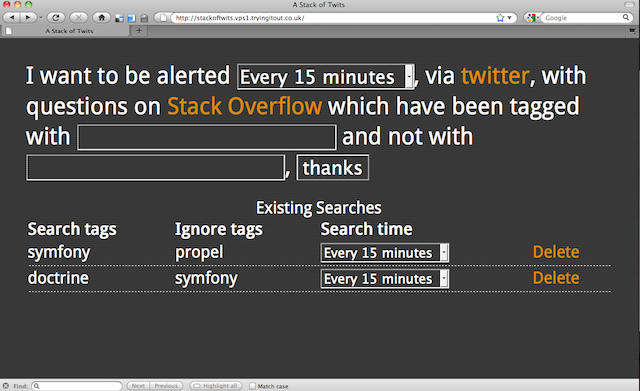 It uses twitter oAuth and makes friends with http://twitter.com/stackoftwits. You will get @updates from @stackappbot. You don't want to follow that account really as if your friends all follow stackappbot you will see a lot of stackappbot posts in your stream! I didn't like the idea of using DMs as this usually generates an email which could also get annoying. Also all the current in beta stackexchange sites. As more sites come out of private beta they will be added. I've built this using symfony but the I have been trying to make the StackApp api code non-library dependent. I do plan on releasing the code that handles this once I've tarted it up. Add question ids and get tweets when answers/comments are posted. Now working with API 1.0 thanks to my PHP wrapper which will be released once I've finished it, I've only implemented the parts I need so far. What time zone is the site in? I'm asking so that I can set the "I don't want any messages between the hours of..." part correctly. How do you include/exclude multiple tags in a single "search"? Can we use the same formatting rules/conventions that search on the SO website uses? How are you going to evade being rate-limited by the Stack Apps API? Also, you should apply for whitelisting on Twitter if you get a lot of users. They don't like it if it looks like you're possibly spamming people. Not the answer you're looking for? Browse other questions tagged app obsolete twitter .